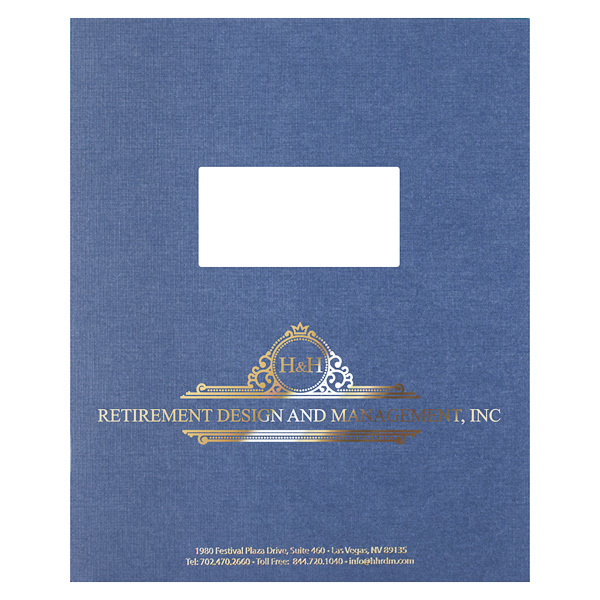 H & H Retirement Design and Management, Inc.
1 foil stamped area on Side 1 of uncoated 100lb Dark Blue Linen stock. This two-piece design for H&H Retirement Design and Management uses thick linen stock, giving it a luxurious texture. The intricate logo stretches across the design for balance and is stamped in metallic gold. Its color warms the cool blue stock and adds a shiny surface to symbolize money and clients' "golden years." Best of all, the smooth foil stamp contrasts the textured stock for a memorable user experience. The 4" x 2" window gives clients a chance to preview 8 1/2" x 11" tax returns and reports in the right v-split pocket. Include a custom title page for every project to increase your order's longevity and add a personalized touch for each client. Both the pocket and panels can be imprinted with original design elements, ranging from brand information and logos to colorful photos and graphics. Dimension Closed: 9 1/4" x 11 1/4"